A bill to allow gay couples the right to civil partnerships is making progress through the Irish parliament. 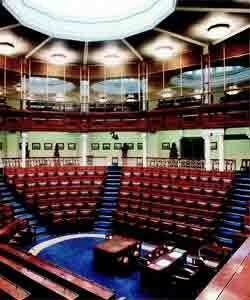 It was presented to parliament in December and completed its second stage in the Dail yesterday. It will now go to a committee for further scrutiny. Gay rights campaigners welcomed the “speedy” progress of the legislation, but continued to cite concerns that it does not recognise children of gay parents. The bill will not give legal support to children being brought up by gay couples and will not allow a non-biological parent to adopt their own children. It will grant rights related to domestic violence, residential tenancies, succession, refugee law, pensions and immigration. Deputy Mary O’Rourke said yesterday that the bill recognises the “love, commitment and fidelity” of lesbian and gay couples and would provide “shape and certainty to their lives together”. Other deputies acknowledged that the bill would greatly help lesbian and gay people to feel “part and parcel of this country” and would significantly strengthen the civil rights of those in lesbian and gay relationships. Brian Sheehan, director of the Gay and Lesbian Equality Network, said that all debates so far on the bill had been positive. “The progress on the Bill and the all-Party support demonstrates strong self-confidence in our ability as a society to make social progress, even in difficult economic times,” he said. But he added there was a “critical gap” in the provisions for gay parents and their children.